If you would like to show your support and sponsor the North of England Koi Show in some form, advertise your business or attend our show please contact our Chairman Stephen Grey. Absolute Koi have sponsored various items for the show including major trophies. Absolute Koi have donated products to assist the show's water purification system. We are absolutley delighted to receive such sponsorship to help support the koi show for years to come. Click on their banner to visit their website. 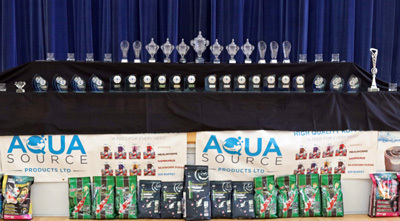 AquaSource Products Ltd are the North of England Koi show’s shirt sponsors. Hikari is Japan's leading manufacturer of fish food and is recognised globally for its exceptional quality. We pleased to announce that Hikari have agreed to sponsor our major trophy winners for 2018. Kusuri have kindly donated the shows dechlorinator to assist the removal of chlorine and chloramines and heavy metals from the mains water. They have also donated a range of their koi food for our koi related raffle. Click on their banner to visit their website. Travis Perkins and Paul Williams have kindly donated all the water protection membrane for the show venue floor. Click on the banner to visit their website. Chris Masters has kindly donated prizes to support our koi related raffle. Click on the banner to visit his website. yoshikigoi are one of our major trophy sponsors. We are absolutely delighted to receive such sponsorship to help support the koi show for years to come. Click on their banner to visit their website. Elite Koi are attending our show as a wet dealer stand they will have many koi for sale as well as comprehensive dry goods including Aqua source products. Elite Koi have sponsored various items for the show including a major trophy. Click on their banner to visit their website. Denby Ponds are one of our major trophy sponsors. We are absolutely delighted to receive such sponsorship to help support the koi show for years to come. Click on their banner to visit their website. Yumi Koi are one of our major trophy sponsors. We are absolutely delighted to receive such sponsorship to help support the koi show for years to come. Click on their banner to visit their website. Evolution Aqua have kindly donated Detox Dechlorinator to assist the show's water purification system, which are a quick and simple method of filtering out harmful chlorine and other impurities from tap water. Click on their banner to visit their website. Rob Atkinson Aka Matsu School of Bonsai will be attending the show and have on display a fantastic range of bonsai for all to see, Rob will also be demonstrating throughout the weekend . Click on their banner to visit their website. Latimer’s Seafood sells the best local, fresh fish in the Newcastle and Sunderland area. Their counter is brimming full of a huge variety of different fresh fish. Latimer’s are situated in Whitburn Sunderland on the North East coastline, overlooking our bountiful seas. Their seaside cafe has fabulous views overlooking the beach at Whitburn. Methley Koi are attending our show as a dealer stand they will have a comprehensive dry goods including Aqua source products. There will be a special Methley koi award for this year's show with the trophy donated by Methley koi. Click on their banner to visit their website.